With the country covering some 1.221 million square kilometres in total, the task of reaching everyone in South Africa with health services is no small feat. South Africa is home to just over 58 million people, of which an estimated 35% live in rural areas. Recent research has shown that the links between poverty and HIV are multidirectional. That is, poverty (and its associated socio-economic imbalances) increases the likelihood of HIV infection, and HIV/AIDS has an impact on families’ ability to move out of poverty. For South Africa to reach the goals of the National Development Plan the intersection of these two challenges must be addressed. But this interaction between poverty and HIV need not become an unbreakable cycle. If health care services and preventative measures are provided in rural areas, this can help families to protect themselves, prevent the spread of the virus and more effectively care for those infected with HIV. This requires that preventative technologies are introduced where they are needed most. One such preventative strategy is Voluntary Male Medical Circumcision (VMMC), which can reduce the likelihood that men will contract and pass on HIV. JPS Africa endorses the idea of ambassadors for change – having people who come from communities trained and equipped as change makers within those communities. Rural communities need not be excluded from these incredible programmes. They simply need a service that can get to them. Enter the JPS Africa VMMC Mobile Truck that reaches out to communities where they are, and provides them with high quality HIV/AIDS prevention, counselling, and advice services. The truck allows JPS Africa to provide free VMMC services in remote and isolated locations, addressing the challenges of space in clinics and limited or unavailable infrastructure. The self-contained unit optimises the use of space to promote maximum reach and capacity. 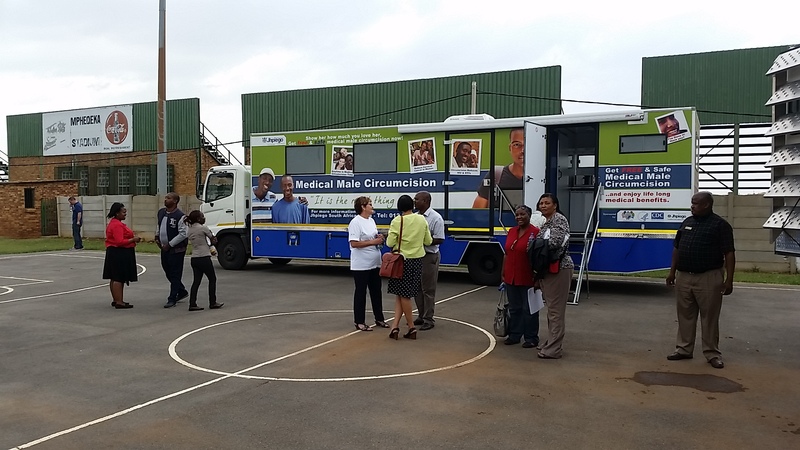 The truck has a waiting area where information on circumcision is provided, has a counselling and testing room where patients can get information about their status. It also allows for the procedure to be initiated and completed on site. With its large and clear branding (and the built-in loudhailer) it also serves as a mechanism for raising public awareness around VMMC and the option to undertake the procedure. The truck allows for integration with JPS Africa’s other health programmes, increasing the overall coverage of health services available to rural communities. The success of the mobile truck strengthened partnerships with existing government services, and ensured service delivery to many boys and men who may not have otherwise accessed VMMC. The mobile unit is making a difference in bringing services to the people and bringing hope to an HIV-Free Generation.